England is not the best possible world but it is the best actual country, and a great rest after America. UK universities are consistently rated among the best in the world, not just in traditional, but also in cutting-edge subjects. UK education may be highly sought-after and respected but it may be little expensive. You can also get application form from university web sites(below), apply by post with your attested certificate copies. UK universities offer a variety of scholarships to help international students study in the UK, There are also several private companies that offer scholarships. Most scholarships are open for application around the time the SPM results are announced and students should plan ahead to find out what is required to ensure your application is successful. About 5 to 20% of international students get some kind of scholarships in UK. Visit Gardian University Guide for all UK Unversities information. 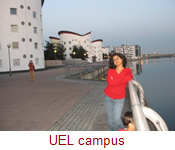 For reasonable fee, flexible study hours, good university facilities and moderately good studies, I recommend UEL (University of East London) especially for international students. The University of East London is an exciting, diverse learning community. They aim to give students an enthusiasm for new ideas, new knowledge and new learning, and the opportunities to excel in their chosen careers. A stunning waterfront building which houses a Business School, state-of-the-art Library and Learning Services, a complex of new IT labs replete with 600 workstations which make up the Trading Floor, and a new 400-seat lecture theatre. A Knowledge Dock Center, which brings together and expands all of the business-facing activities and services, ranging from incubator and start-up space through to a new Jack Petchey Center for Entrepreneurship as part of the Business School. A student residences which provides additional accommodation for over 800 students as well as improved facilities and social areas . Uni also has some facilities which you wouldn't expect -for example, an on-site manufacturing facility offering the opportunity of real world manufacturing experience from a business or engineering point of view; and a multimedia production center offering professional facilities and experience for students and local businesses, including two industry-standard television studios for film production. 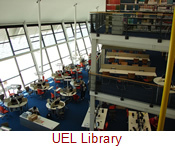 For more information visit UEL. Visit Gardian University Guide for all UK unversities rankings.